Dimensions: Coasters - 4" square; Mugs - 10 oz. 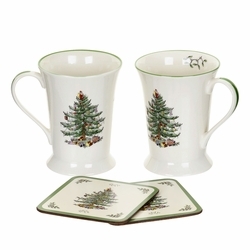 Product Care: Mugs - Dishwasher safe; Coasters - Wipe clean with a damp cloth. 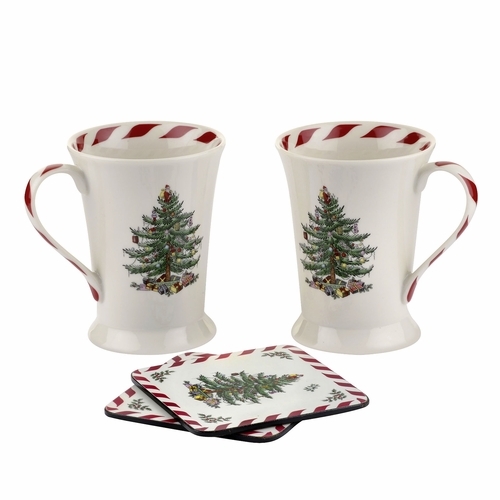 This mugs and coasters set includes two porcelain mugs perfectly sized for coffee machines, as well as two matching coasters. Designed for modern day living, the mugs are dishwasher safe. A fantastic gift for coffee lovers. Christmas Tree is one of the world's best known holiday designs since its introduction in 1938. Each season sees wonderful new introductions for collectors both old and new. Christmas Tree adds a distinctive charm to every table - celebrating traditions and creating memories.